Shelves can enhance the look of a room as well as provide storage space. They can be made from different materials for a variety of uses, such as wood for holding books and household equipment, and glass for displaying ornaments, photographs, and small plants. • Filling shelves safely: Be careful not to overload a shelf, because it may sag. If you plan to build shelves, add more support than you think you will need. If adding objects to a shelf, make sure that the span is adequately supported to bear the extra load. • Organizing objects: Keep objects near where they are most likely to be used. Do not put frequently used items on shelves that are too high to reach comfortably. • Storing small objects: Create shelves within shelves to store small items. For example, put a spice rack at the back of a shelf, or use a wooden cutlery holder placed on its side. • Keeping shelves neat: Label the fronts of shelves so that people can put objects back in the correct places after use. • Dividing a Large Room: Use open shelves to divide a large room for different functions. For example, place open shelves between a living area and a dining area to form a practical screen. Make the shelves deep enough that both sides of the unit can be used for storage or displaying objects. You can construct simple shelves quickly and easily using only bricks and wooden boards, without the need for any special tools or equipment. It is best to choose attractive bricks that are in good condition, and sturdy wooden boards that are at least in (15 mm) thick. Build one or two more shelves than you think you will need. As you work, make sure that each level is steady and properly supported. Making basic shelves: Arrange bricks in columns, each three or four bricks high, and lay a board across the bricks. Allow the ends of each shelf to overhang the bricks by a little way for stability. To add shelves, pile more bricks on top of the first shelf, following the original columns. When adding bricks, check that the height of each shelf will accommodate the objects that you intend to display. Making Use of drawers: Drawers provide many different types of storage space and can be large or small, deep or shallow, to suit particular items. It is possible to divide space inside drawers so that you can see the contents at a glance, and keep small items neat and easily accessible. • Fitting drawers into spaces: When shopping for a chest of drawers, take with you the dimensions of the space where you wish to stand it so that you can check that it will fit before buying. • Positioning a set of drawers: Allow enough room for an adult to kneel in front of a chest of drawers when a drawer is fully open. • Choosing units: If possible, select units with drawers of varying depths. Store items such as underwear in shallow drawers, and larger items such as sweaters in deep drawers. • Storing items flat: For large objects that must be kept flat, such as artwork or fabrics, use a flat file, available from art shops. Flat files have wide, shallow drawers designed to hold such items. • Using deep spaces: Consider installing deep, sturdy drawers for large objects such as board games or photograph albums. • Do not overfill drawers: Every few months, clean out the drawers to remove accumulated dust and dirt. At the same time, examine each of the drawers for any signs of damage. • Filling drawer space: Leave at least 1 in (2.5 cm) between the top edge of a drawer and the top of the contents. This will keep the objects inside from spilling over and jamming the drawer. • Packing sharp objects: Wrap blades and sharp edges before storing items. Otherwise, bare metal points and blades could blunt one another and could cut anyone using the drawer. • Never keep a very heavy object in a drawer: Even if the object fits in the space, its weight may put excessive strain on the bottom of the drawer. • Waxing runners: Rub a piece of soap, or the end of a wax candle, along drawer runners occasionally. This will enable the drawers to slide smoothly and keep them from sticking. • Making safety stops: If an old set of drawers has rails that separate the drawers, nail a line of corks into the underside of each rail. The corks will catch the back edge of the drawer so that it can not be pulled out. • Labeling for clarity: It is often useful to label the front of each drawer with details of what is in it. It may be helpful to children if you label their drawers with lists of the clothes that they contain. Make separate labels for items such as socks, T-shirts, and sweaters. • Preserving clothes: Arrange clothes in drawers so that the most delicate are at the top and durable garments are at the bottom. For example, keep blouses on top of T-shirts. This will prevent clothes from becoming overly creased. • Arranging implements: Lay long, thin objects such as ladles so that they all face the same way. This will keep them from becoming jumbled. • Keeping tiny objects Put a miniature set of drawers on a shelf, desk, or table, to hold objects such as jewelry or sewing items that might get lost in a larger drawer. • Maintaining interiors: Line drawers with wallpaper scraps so that they will be quick and easy to keep clean. Replace the lining paper as soon as this becomes necessary. • Cleaning up spills: To stop spills in a drawer from congealing, wipe out instantly. Using drawing pins, attach elastic to the left and right sides of a drawer. Tuck bottles inside die elastic. They will not fall over and will be easy to remove. Making drawer dividers: To organize items such as socks in a drawer, use a divider from a bottle box. Cut the divider to the size of the drawer, and push it in. Place small items in the spaces. Many parts of your home have potential as spaces above doors and windows, the backs of storage space; don’t limit yourself to doors, unused walls, and any nooks and built-in units and shelves. Consider using the crannies that could hold a small shelf or cabinet. 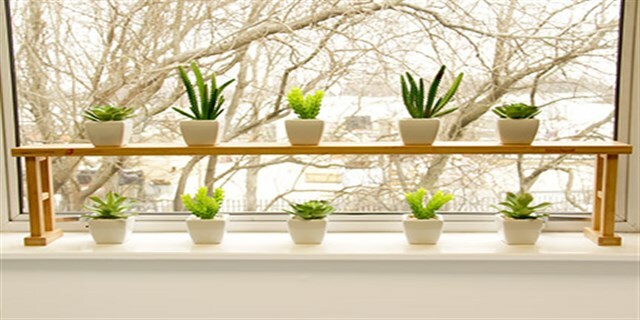 Using Small Spaces: Decorating windows Small empty spaces can fulfill decorative as well as practical functions. For example, you could put glass shelves across a window with no view. Display glass ornaments on them; the objects will catch the light coming through the window. Make a wine rack from plastic drain pipe 5-6 in (12-15 cm) in diameter. Cut the pipe into 12-in (30-cm) lengths. Glue these together in groups of six, and secure the groups with rope. Creating storage units: Keep spare bedding, unused clothes, and children’s toys in sturdy cardboard or plastic boxes. Before storing clothes and bedding, line the boxes with plain white paper. Tuck lavender sachets into fabrics to protect them from moths. 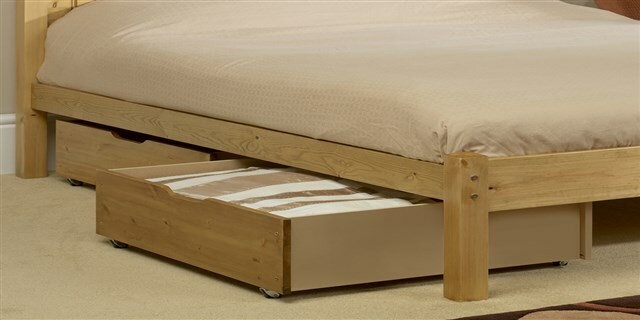 Keep large, shallow boxes under high beds for extra storage. To make the boxes mobile, screw castors to the undersides, at each corner. Attach a handle or loop of rope to the front of each box. • Filling a niche: If there is a gap between kitchen cabinets, slide clothes rack into it to hold dish towels. Alternatively, if space is high enough, use it to store brooms and mops or keep an ironing board. • Hanging shelves above doors: If there is reasonable space between a ceiling and the top of a door, install a narrow, well-supported shelf to hold ornaments or small objects. • Using empty wall spaces: Put narrow shelves in the space between a door or window and a side wall. If a door opens onto the wall where you will put the shelves, make sure that they will not obstruct the door. • Using a child’s room: Store rarely used items in high cabinets or on top shelves in a child’s room. Check that the child cannot reach the area so that he or she is not likely to pull items down and get hurt. Hang a net across the ceiling of a garage to hold large, light items. If the garage door slides upward to open, ensure that the net does not obstruct the mechanism. Do not overload the net otherwise, it may sag onto the roof of your car. Hanging long tools on a wall: Cut a length of wood. Drill a line of holes along it, holding the drill at an angle, then put dowel pegs in the holes so that the pegs point upward. Attach the wood to a wall. Hang tools on pegs with bristles or tines facing the wall. 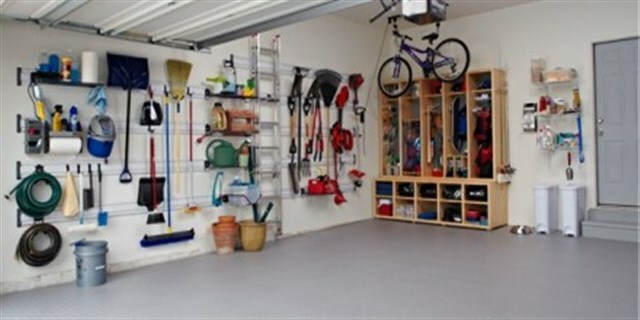 Be careful that you do not allow a garage or shed to become disorganized. It is only too easy to use the space as a dumping ground for objects instead of clearing them away immediately. • Arranging storage: Group items such as tools together so that you can find them easily. • Adding space: Hang secondhand kitchen cabinets on the walls. Put locks on cabinets used to store harmful substances. • Adding a work surface: Mount a fold-down table on one wall for repair work and other tasks. • Using electricity: If you plan to use the space as a workshop, install plenty of outlets.